Learn how to make crispy baked chicken wings in the oven with these easy steps. Works perfectly every time. If you love chicken wings as much as I do, you probably have your favorite wing joint. I enjoy going out for wings, but more often that not I like to make them at home. When you make your own chicken wings, you can prepare them however you’d like. 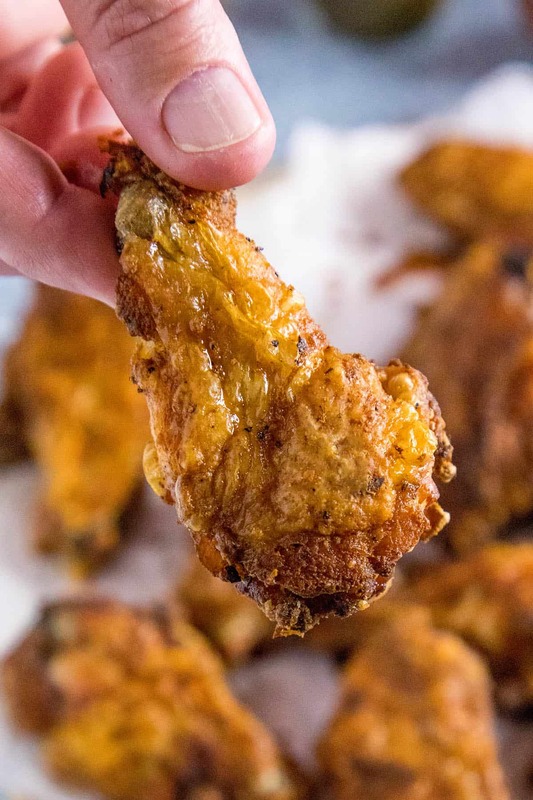 Most wing joints serve up fried chicken wings. While I greatly enjoy them, I prefer to bake them at home. It saves on calories, and I like to limit my intake of fried foods. The thing is, I also LOVE my chicken wings to be CRISPY. YES! For some, “baked chicken wings” doesn’t always equate to “perfect crispy chicken wings”. But guess what? Now they do. 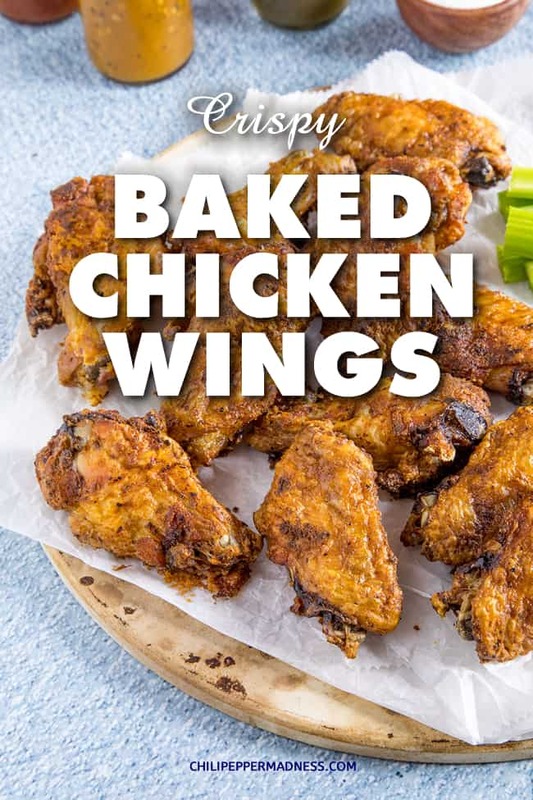 Let it be known that you can bake your wings at home AND enjoy them super crispy. I’ve been making baked chicken wings at home for years, and this is the method that works best for me. As a chicken wing fanatic, it’s important to get them right every time. No one likes to lose out on great wings! 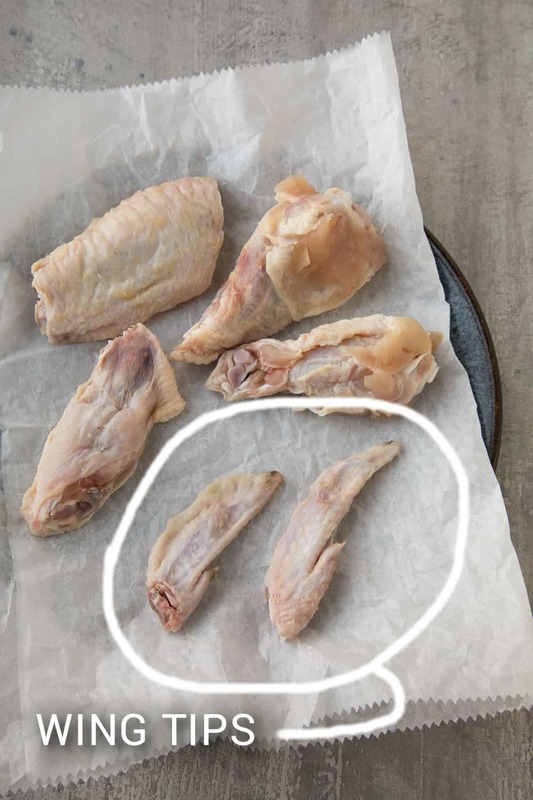 I will share a step-by-step recipe below for you to follow, but let’s discuss the important factors that affect the crispiness of your baked chicken wings. Drying the Chicken Wings. Pat them very dry with a paper towel to remove as much moisture as possible. You can also set them in the fridge after this step and leave them overnight to dry out even further. Baking Powder and Salt. Baking powder and salt help to draw the extra moisture out of the skin where it can evaporate. Moisture is the key reason why oven baked chicken wings don’t crisp up as desired. Very important! The Baking Process. 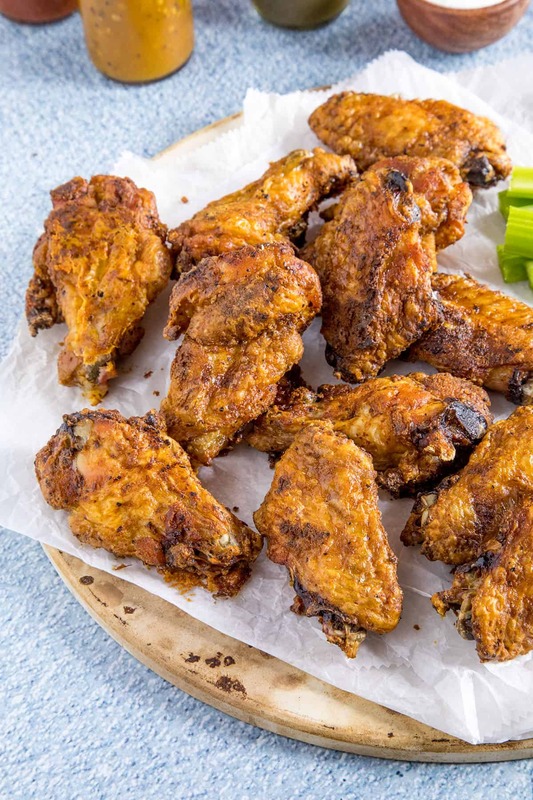 Bake the wings first at 250 degrees F (120 degrees C) for 30 minutes, then turn up the heat and bake another 30 minutes (or until they are cooked through and nice and crispy) at 425 degrees F (220 degrees C). If you’re looking for even MORE crispiness, turn on the broiler at the very end of the cooking time for a couple minutes. Just be careful to not burn them. You can see the crispiness when you take them out of the oven. You can feel the crispy dryness on the skin. It is awesome! Let’s run through the recipe so you can see the steps. Then I will answer some common questions. We can also explore some alternative cooking methods. Extra seasonings as desired – I used 2 tablespoons Homemade Creole Seasoning, but any of your preferred seasonings will do. First, remove the wing tips and separate the wings. Like so. I like to save the tips in the freezer for making chicken stock. Pat the wings as dry as you can get them. This will help with the crispiness. I use paper towels. Next, set the wings into a large bowl and season with baking powder, salt, and your preferred seasonings. Toss to get them nice and coated. The baking powder helps with the crispiness. For extra dryness, cover the wings and refrigerate them overnight to let even more moisture evaporate. Next, set your wings onto a baking sheet. You can line the tray with aluminum foil, parchment paper, or use a silicone mat. Another option is to bake them on a wire baking rack set atop a baking sheet. This will allow the rendered fats to drip through and pool below. The racks are difficult to clean, though. I usually just use my silicone mat and am very happy with the results. 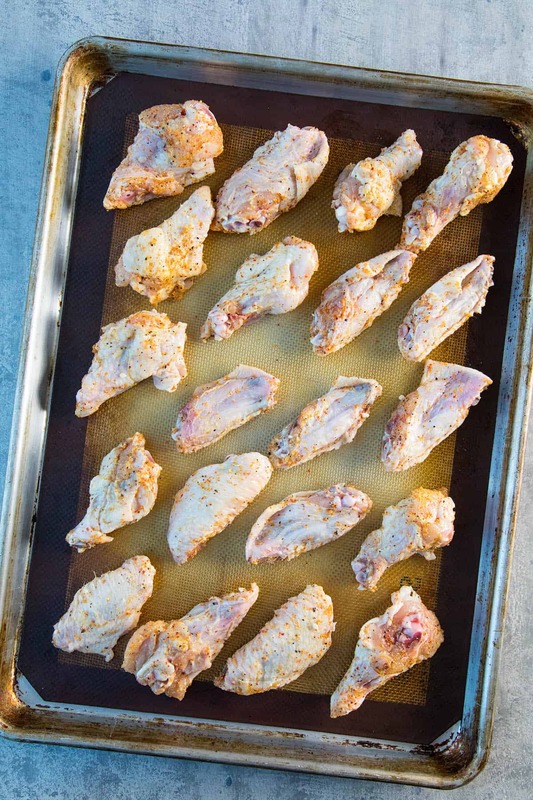 Preheat your oven to 250 degrees F. Set the wings onto a lightly oiled baking sheet and bake for 30 minutes. Increase the oven temperature to 425 degrees F and bake the wings another 30 minutes, or until the wings are cooked through and the skins are nice and crispy. If you’d like, you can hit them with the broiler for a couple minutes for an extra blast of crispiness. BOOM! Done! Crispy baked wings! I love them. So wonderfully golden brown. Serve as is, or toss them with your favorite wing sauce. Try my Homemade Buffalo Sauce Recipe. It rocks! Here are some common questions and talking points I hear about making your chicken wings nice and crispy in the oven. It is very important that you use Baking POWDER, NOT Baking Soda. 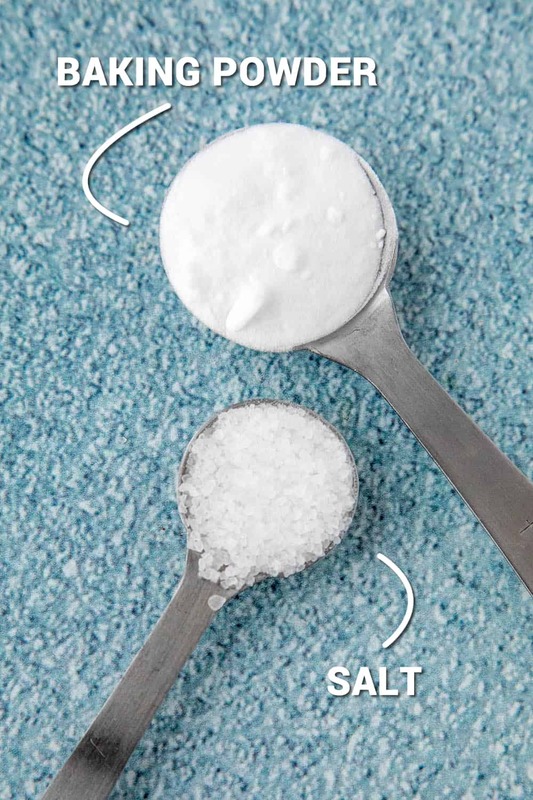 Baking soda is very different from baking powder and should not be used for this recipe. Please be sure to use baking powder. I’ve tried a number of different variations, and some of them work to a certain degree. As I said, this method has worked the best for me for many years, but the other methods are worth mentioning. I’ve tried this method and wasn’t as happy with the end results. Parboiling is the process of first boiling the chicken wings in unseasoned water for a few minutes to render out some of the fat. Then they are dried and baked in the oven until they become crispy. The idea is that removing some of the internal fat will result in crispier overall wings. The resulting wings were pretty good, but you lose a bit of flavor and substance when you lose some of that fat. It does save on a few calories, however. I’ll stick with my preferred method. Some recipes call for using almost the exact method that I use, except for one step. They do not switch up the temperature half way through. Instead, they bake the wings at 400 degrees for 45 minutes straight, or until the wings are cooked through. The result? Yes, the skins were rather crispy. It does work, but one batch of mine still didn’t quite match the crispiness that I’m used to. The verdict? you might save a bit of time this way, but not much. Baked chicken wings are a healthier alternative to fried chicken wings because of all the oil in fried foods. The oils add a lot more calories in the cooking process. A average baked chicken wing (half, not whole wing) is 81 calories, with roughly 8 grams of protein and over 5 grams of fat. They are no carb. Keep this in mind if you’re counting calories. What are the Best Side Dishes for Chicken Wings? 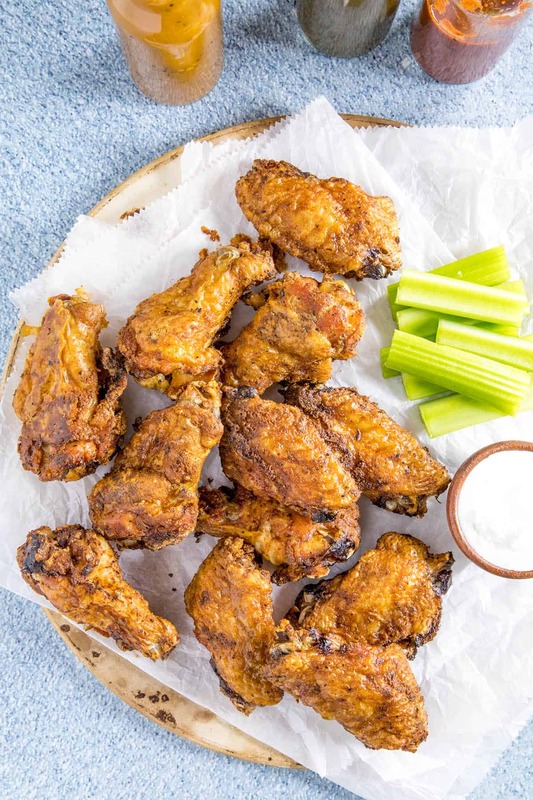 Chicken wings are often served with either ranch dressing or blue cheese dressing, along with a side of celery sticks or carrot sticks. The dressing is meant to be a cooling element to help if your wings are too spicy. I love mine spicy! Got any questions? Ask away! I’m happy to help. If you enjoy this recipe, I hope you’ll leave a comment with some STARS. Also, please share it on social media. Pat the wings as dry as you can get them. This will help with the crispiness. 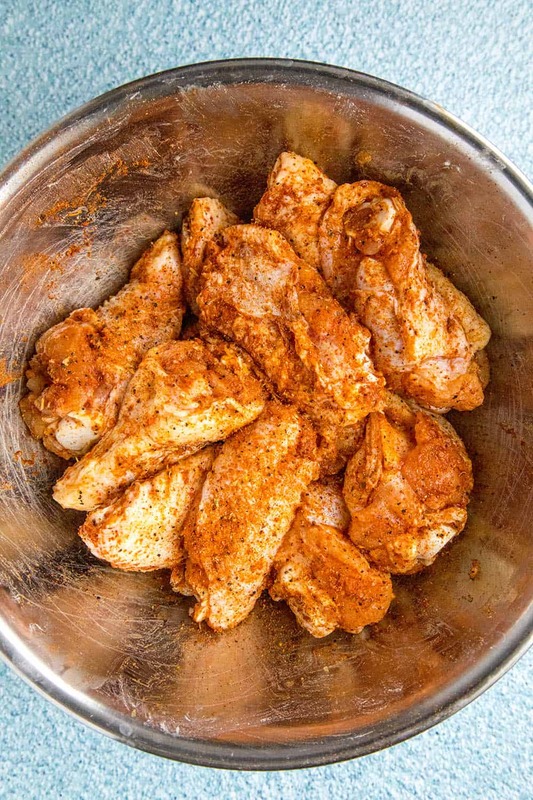 Set the wings into a large bowl and season with baking powder, salt, and your preferred seasonings. Toss to get them nice and coated. The baking powder helps with the crispiness. See the discussion above. 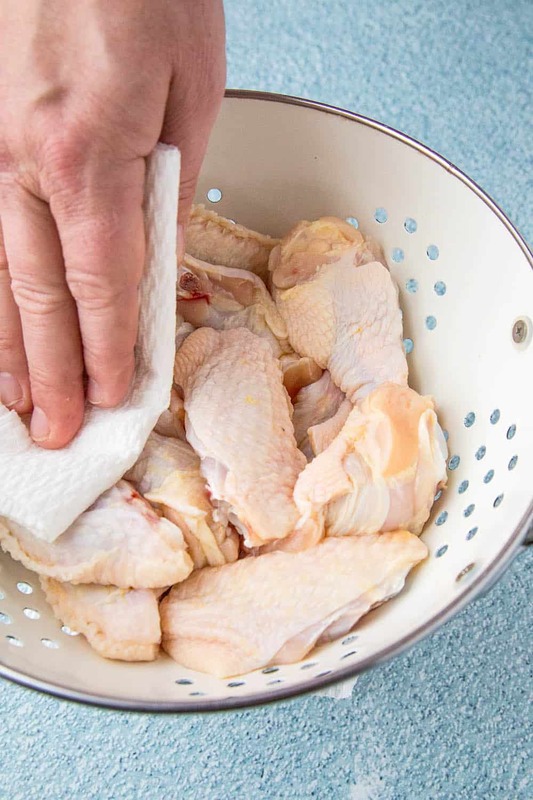 For extra dryness, cover the wings and refrigerate them overnight to draw out even more moisture. Heat oven to 250 degrees. Set the wings onto a lightly oiled baking sheet and bake for 30 minutes. Increase oven heat to 425 degrees and bake another 30 minutes, or until the wings are cooked through and the skins are nice and crispy. If you'd like, you can hit them with the broiler for a couple minutes for an extra blast of crispiness. Calories are estimated per whole wing. The only problem with this recipe was… I didn’t make enough!!! Very simple recipe to follow. Last 5 minutes of cooking was under the broiler, they turned out perfect. Excellent, Mike! Thanks! Super happy you loved them. I LOVE wings! I’ve tried baked wings with the baking powder and they were awesome! Looking forward to trying your technique of the split cooking times. Thanks for the recipe! Wow! These Chicken Wings looks soo tempting and irresistible that I can’t wait to try it. Thanks for sharing this delicious recipe. Excellent, Bubba! Perfect crispy baked chicken wings every time.